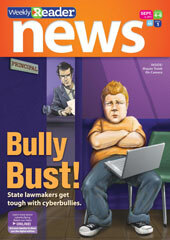 Cyberbullying was the cover story in Weekly Reader News, Ed. 4-6, on 9/2/11. Found a really resource in Weekly Reader News, Edition 4-6, with their cover story on cyberbullying. As more and more students become more connected, cyberbullying has taken center stage, finally being seen as a real and destructive element of modern childhood. Weekly Reader did a great job of telling my students how to respond to online bullying. First children should collect evidence, something that they don’t often do because the first reaction to a nasty post or text is to delete it. This led to a lesson on how to collect evidence. I taught students how to use the “print screen” feature to save messages and Facebook posts. The second step of course is to report the bullying. Every state is different in how they handle cyblerbullying. In Wisconsin, we are instructed to treat it like any other form of harassment. Even if the bullying takes place outside of the school (or on the Internet), the school can take action if it prevents a student from feeling safe at school. I like that the article portrayed cyberbullying as a crime, making it clear to students how serious this behavior is being taken around the country.